Several weeks ago, we posted the first installment in our new series, “Steak and Potatoes.” We thought now was an appropriate time to post another as everyone is weary of Thanksgiving leftovers and hungry for a good piece of steak! Tuscany’s cuisine is primarily based on the concept of “cucina povera,” which translates to “poor kitchen.” Pasta, beans, local vegetables, and olive oil are the primary building blocks of Tuscan cuisine. Which is why it’s ironic that one of the region’s most famous dishes is a pricy indulgence. I speak, of course, of Bistecca alla Fiorentina, otherwise known as Florentine steak. 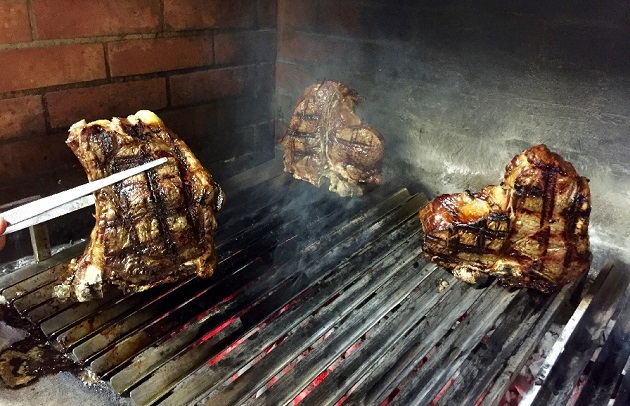 Although I know that it doesn’t sound like much when you describe it—an olive oil-basted, grilled porterhouse steak—bistecca alla Fiorentina is one of the high holies of Tuscan cuisine. But here, as in so much of art, perfection lies in the details. This dish, which is easy to replicate at home, begins with a massive porterhouse or T-bone that is three to four fingers thick weighing at least two pounds. (The cut comes from the rear of the loin to maximize its size.) Ideally, the meat will be aged from 14 to 21 days or more to tenderize it and deepen its flavor. As you likely know, porterhouses and T-bones are actually two steaks in one—a strip steak and a tenderloin (filet mignon) separated by a T-shaped bone. In Italy, a massive but very lean breed of cattle called Chianina was traditionally used for bistecca alla Fiorentina. It is rarely available in the U.S. Today, even Tuscany’s most respected chefs use beefsteak imported from Spain, Argentina, and Australia. Acquiring this magnificent hunk of meat—and paying for it!—will be the most difficult task if you want to make this Tuscan specialty at home. Yes, you can expect to pay between $50 and $90 for one steak. But it will generously feed three people, and will be less expensive than a typical steakhouse meal. The rest is relatively easy. Generously season the steak on both sides with coarse salt and pepper; we use Maldon sea salt or kosher salt. When the fire is mature (or the gas grill is hot), grill the steak for 6 to 8 minutes per side. It will be very rare in the center—barely warm. We like to balance the steak on the bone (the crossbar of the “T” will stabilize it) for several minutes more to channel the heat through the center. If you or your tablemates prefer steak that is closer to medium-rare, finish the steak by indirect grilling it to the desired temperature. (Alternatively, you can transfer the steak to an oven preheated to 350 degrees.) Do not overcook the steak! Transfer the meat to a welled cutting board and let it rest for 5 minutes before carving each steak off the bone and slicing into slices about 1/4-inch thick. Use a spatula to transfer the sliced steak to a platter, placing the bone in the center of the reassembled meat. Pour any juices from the cutting board over the steak, then drizzle generously with the best-quality olive oil in your kitchen (Steven and I exclusively use oils from the Fresh-Pressed Olive Oil Club). Serve with additional salt, pepper, and if desired, lemon wedges for squeezing. Tuscans often eat their bistecca alla Fiorentina with cannellini beans stewed with tomatoes and sage. But we also like Steven’s garlicky fingerling potatoes, preferably roasted indirectly on the grill.